The water and sanitation sector in Uganda is facing a situation of stagnating coverage, functionality and budgets. In order to increase efficiency of investments in the sector, it is necessary to improve financial planning and budgeting, and a first step was done in April to July 2012 by IRC and Fontes. An information scan looked at the current tools involving cost data used for financial planning and budgeting. It also mapped the expenditure flows of the entire rural water and sanitation sector in Uganda, including all the main actors involved in channeling funds, from the donor level to the private sector actually carrying out the works on the ground, and the government entities involved in monitoring and follow up. In addition, an attempt was made to categorise the main budget items into the LCCA framework categories, in order to create a roadmap for a cost data collection exercise currently going on in one district, where the actual numbers are recorded to analyse the correlation between the way services are financed and the actual service levels provided. 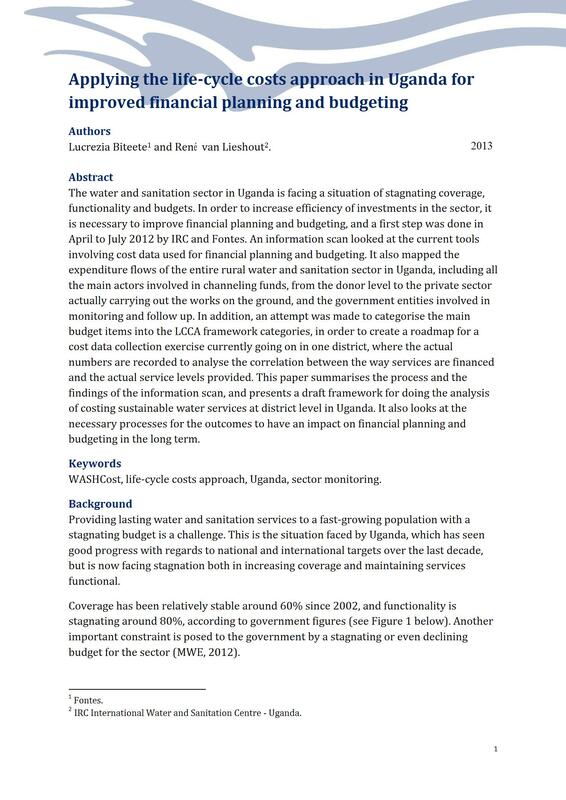 This paper summarises the process and the findings of the information scan, and presents a draft framework for doing the analysis of costing sustainable water services at district level in Uganda. It also looks at the necessary processes for the outcomes to have an impact on financial planning and budgeting in the long term.